CEDAR RAPIDS — Cedar Rapids police have helped an Anamosa teen replace a collection of police-related items after the teen’s father, an Anamosa officer, was killed in a traffic crash last month. 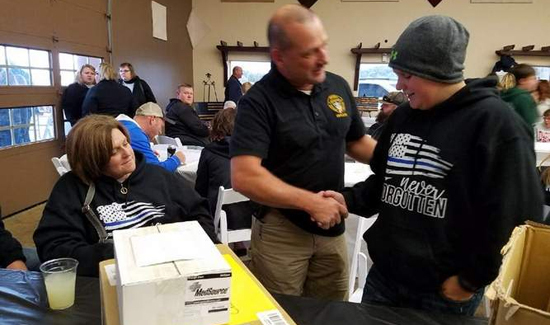 According to a post on the Cedar Rapids Police Department’s Facebook page, officers recently presented Shane Kelchen with a collection of items from police departments across the country, including challenge coins, T-shirts, hats, patches and business cards. Kelchen’s previous collection had been destroyed, according to the Facebook post, and people across the country donated items to replace the items. Kelchen’s father is Mitch Kelchen, an Anamosa police officer who was killed in a crash Sept. 2 while off duty. A memorial motorcycle ride was held Sunday to honor Kelchen and his family.